If you are interested in purchasing a Matterport Pro2 and qualify* for the early bird special - advertised as $200 - my impression is that it is likely that you can get $500 by asking (nicely) a Matterport Sales Rep, if your camera is outside the six month. 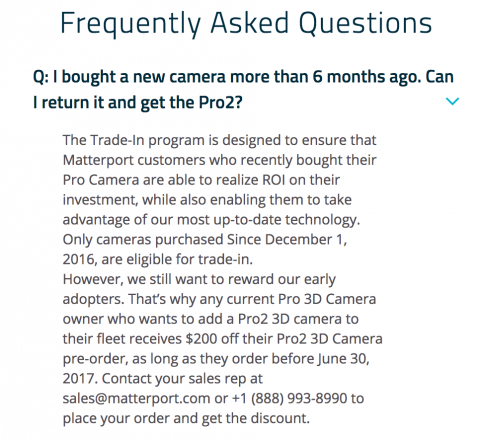 *The Trade-In program is designed to ensure that Matterport customers who recently bought their Pro Camera are able to realize ROI on their investment, while also enabling them to take advantage of our most up-to-date technology. Only cameras purchased Since December 1, 2016, are eligible for trade-in. However, we still want to reward our early adopters. That’s why any current Pro 3D Camera owner who wants to add a Pro2 3D camera to their fleet receives $200 off their Pro2 3D Camera pre-order, as long as they order before June 30, 2017. Contact your sales rep at sales@matterport.com or +1 (888) 993-8990 to place your order and get the discount. I hope this helps you save $500 instead of $200. Do the early adopters who act on this offer receive a new unit or a refurbished one? I just placed an order with that code. Thank you. $500 off was applied. My camera is only 6 weeks old so I hope they'll honor the coupon code. I expect my unit will be a refurb unit as that's part of the agreement of the trade-in. @DanSmigrod THANK YOU! I had actually called sales and left a voicemail earlier today. No response but just tried the code and indeed got $500 off. Order placed! Just my opinion. I had a camera swapped out with a refurbished unit after I sent it in for repairs. Did not notice a single difference and have not had any issues with the refurbished unit. Quick question... it makes you order a subscription. I already have one so will they figure that out or should I call in to cancel? Any thoughts? Cancel and talk with a rep. When you check out, login with your account. It will know you already have a subscription and then remove it from the order. That's what happened for me. Refurbished. That said, I would be surprised if they had enough refurbished and will fill some orders with all new. How did you find out about the code? Is it an old code that was still active? Members of the Forum are kind enough to share news with me provided that I share it anonymously. So, I'm questioning whether the $500 discount can be used in conjunction with my trade-in since mine is so recent. I'm wondering if this discount is purely for the purchase of an additional camera. I received an email today about the updated program to "better support our newest customers" but the trade in value for my camera hasn't changed. So, how is that "better support"?